Uribe has visited Panama twice in recent months, saying he considers construction of the highway to be of “huge importance” and a critical issue in relations between the two countries. The Colombian leader believes the road would help his nation improve its economy by allowing Colombian goods to gain faster access to markets in Central and North America. 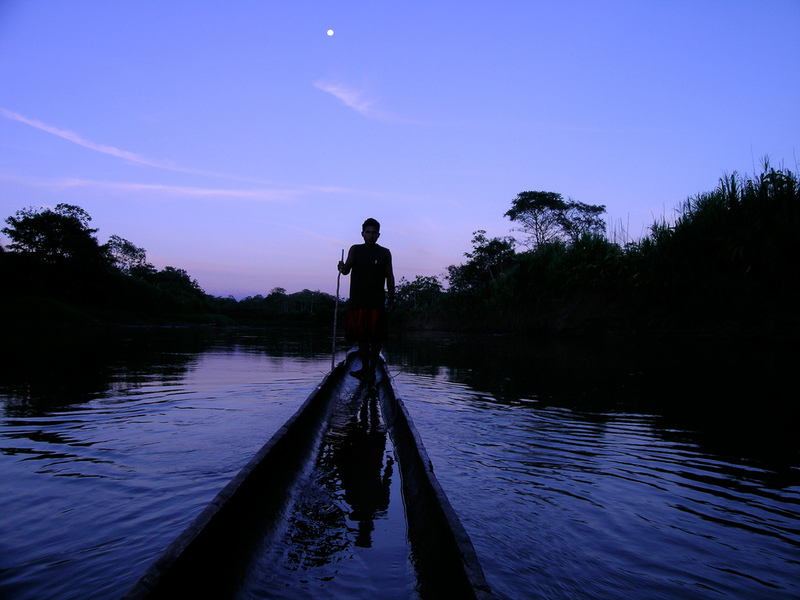 Wounaan leader Isidro Solis on the Rio Tuira in Panama’s Darien Province. Solis and his villagers live within the Darien Gap and fear the construction of a road there would increase security concerns along the Panama-Colombia border. Not so fast, says a coalition of indigenous groups, environmental activists, and business and political leaders in Panama. In the capital, Panama City, high-ranking business, political, and environmental leaders interviewed for this story expressed serious concerns over Uribe’s proposal, a sentiment mirrored by the southern Darién’s indigenous groups. Lider Sucre is a Harvard Business School graduate who leads Panama’s environmental activist group the Association for the Conservation of Nature, or ANCON. “Our government has to maintain good relations with Colombia, but a road through the Darién would be devastating for us,” Sucre said. Sucre believes the destruction of forest habitat would harm several species of birds, which exist nowhere else in the world. The ANCON leader said his group also supports Panama’s cattle ranchers, who believe the Darién Gap acts as a natural barrier to the importation of hoof-and-mouth disease. As if to underscore Panama’s unease Panamanian Border Police recently reported the seizure of several tons of cocaine in the Darién—contraband that investigators believe originated in Colombia. And within recent weeks, the Colombian Army suffered major casualties in an ambush by antigovernment guerrillas known as the FARC in Colombia’s remote northwest near the border with Panama. The FARC often retreats into the Darién. Panamanian authorities say that the FARC and anti-FARC, pro-Colombian government paramilitaries and drug smugglers have committed atrocities inside Panama. The head of Panama’s National Police, Gustavo Perez, is responsible for day-to-day operation of the border-police units. In an interview in Panama City, Perez described security in the border region as a constant challenge. “We have drug dealers and FARC people coming into the country, and we also have a lot of (illegal) immigration making things inconvenient for our country,” Perez said. Perez doesn’t agree with those who believe a road would make it easier to control the flow of guerrillas, paramilitaries, drugs, and illegal immigrants. Asked how a road in southern Darién would affect his work, Perez is emphatic that it would only complicate an already difficult security situation. Perez’s boss, Minister of Justice Hector Aleman, also expressed serious reservations about the Darién Gap roadbuilding proposal. 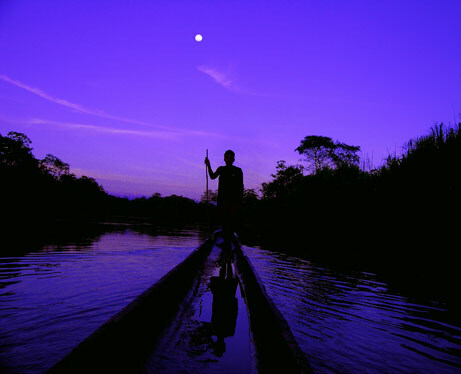 Its takes an hour by small plane from Panama City to the jungle hamlet of El Real and another four hours by dugout canoe to reach the geographical middle of the southern Darién. The region’s two indigenous groups, the Wounaan and Embera Indians, have seen parts of their territory ravaged by an influx of poachers and loggers, which was triggered by the construction of a road in the northern Darién. Not all Indians oppose the road plan, especially those employed as seasonal contract loggers. But most indigenous leaders interviewed for this story said they are aghast at the notion of extending the road. They point to the area flanking the existing road in northern Darién, noting that it is denuded, treeless, and barren. But like their counterparts in the Panamanian capital, the Wounaan and Embera say their environmental concerns are trumped by fears over border incursions. Colombian President Alvaro Uribe recently told a group of prominent business leaders that a road will allow authorities in both nations to control the flow of people and goods in either direction. He pledged to minimize a new road’s environmental impact and drew laughter from the business leaders, when he said that “only good Colombians” will use the road to enter Panama. Panama’s recently elected president, Martin Torrijos, now wrestles with a dilemma. He is popular, enjoying both a recent electoral victory and iconic status as the son of legendary Panamanian strongman Omar Torrijos. The elder Torrijos dominated Panamanian politics from the late 1960s until he was killed in a plane crash in 1981. He negotiated the Panama Canal Treaty with United States President Jimmy Carter in 1977, which returned control of the waterway to Panama in 1999. The president elaborated, saying that the argument that the road would give Panama greater control of security in southern Darién, can be contradicted by the argument that the road would give undesirable elements easier access to Panama. His supporters and seasoned observers of Panama’s political scene say President Torrijos is willing to consider expanded ferry links with Colombia. But, they say, he is wary of roadbuilding’s threat to the possibility of increased ecotourism revenue in the Darién. But these same backers and observers also say that Torrijos cannot dismiss the Colombian President’s proposal without at least formally considering the idea out of respect for a valued neighbor and trading partner. Interpreter Raymond Mizrachi in Panama contributed to this report. This entry was posted in National Geographic, Photography, Print and tagged Colombia, drug trafficking, National Geographic, Panama. Bookmark the permalink.